The Center for Spiritual Living St Augustine is a spiritual community and way of life that honors all paths to God. We provide spiritual tools for personal transformation, and it is our intention to help make the world a better place. As an Open and Affirming Community, we extend a warm welcome to all people in search of a spiritual community where they are respected and accepted for who they are - we strive to inspire and support each and every person in growing into their highest potential. Center for Spiritual Living is a place to make friends, share experiences with like-minded people, and know the power and presence of God in your daily life. What We Believe - Our Guiding Principles Center for Spiritual Living -St Augustine is an affiliated member of Centers for Spiritual Living, a global organization with hundreds of "centers" for spiritual living. We believe that the Universe is fundamentally spiritual, and that it has intelligence, purpose, beauty and order. Our beliefs are in harmony with the basic tenets of all the world's great religions and for that reason we honor all paths to God. Whether we call it God, Spirit, Energy, or Universal Intelligence, every person, place and thing emanates from this spiritual universe. We believe this Universal Intelligence is within us, as well as around us, and that we are conscious of it. We believe that God is a loving intelligence, operating in and through all life, never separate from anyone or anything. 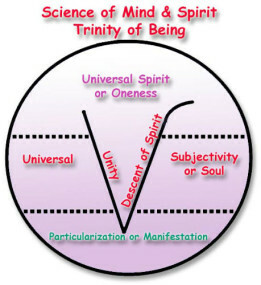 Through classes, study, and spiritual practice we come to understand our oneness with this indwelling Divine Presence. We teach and practice a way of life where we can all learn how to live in accordance with spiritual principles. These principles, which we call the Science of Mind®, are as reliable as the laws of physical science. We believe there is a body of knowledge about spiritual laws that operates in the Universe as Cause and Effect. We teach that "It is done unto you as you believe" and "As you think, so you become." In essence, our thinking and our expectations create our reality. It is in studying and applying spiritual laws that we can change our unconscious beliefs and create improved conditions in our lives. Each spiritual community within the Centers for Spiritual Living teaches Affirmative Prayer and other spiritual tools designed to help us lead a spiritual life, think positively, and love deeply. Simply put, at Center for Spiritual Living, we provide spiritual tools to transform our personal lives and make the world a better place. We Are a New Thought Spiritual Community Center for Spiritual Living is a "New Thought" spiritual community and is an affiliated member of the Centers for Spiritual Living. In 2009, we changed our name from The Center for Positive Living to Center for Spiritual Living - St Augustine. We are dedicated to diversity, inclusivity, transparency and good stewardship in the community and of the planet. We continue to grow as a strong and vibrant spiritual community and are an affiliated member of the Centers for Spiritual Living, one of several organizations that are part of the New Thought Movement. The New Thought tradition dates to the 1880s and has its roots in the Transcendentalist Movement of the 1830s. New Thought has a long and respected history, and includes luminaries such as Ralph Waldo Emerson, Walt Whitman, Phineas Quimby, and Emma Curtis Hopkins. Some of the better known authors today whose writings parallel our teaching are Wayne Dyer, Deepak Chopra, Eckhart Tolle (author of A New Earth: Awakening to Your Life's Purpose), Michael Beckwith, Barbara Marx Hubbard, Caroline Myss, Byron Katie, and many others. Our teachings incorporate the ancient wisdom of all the spiritual traditions through the ages. People of all spiritual paths - Christian, Jewish, Buddhist, Hindu, Islam, New Age and others - are all welcome in our communities. Our Teaching's Founder Dr. Ernest Holmes' (January 21, 1887 - April 7, 1960) book, The Science of Mind, is recognized today as one of the leading viewpoints in modern metaphysics and New Thought. Dr. Holmes developed a universal philosophy and tools for spiritual living that profoundly resonate to this day. His work provides us with a personal spiritual path, an understanding of our relationship with the Universe, and a highly conscious, connected and joyful approach to daily living.